I swapped Netflix for personal development books, low calorie diets for whole foods, and learned from the best mentors in High Performance, Personal Story Power, and Online Marketing. I released over 100lbs and built a six-figure online speaking, writing, and coaching business from my kitchen table. As a Registered Nurse, ACE Certified Trainer in Fitness, Nutrition, Youth Fitness, Seniors Fitness and Pain Free/ Function First Movement, I have a unique background and passion for freedom in families. Freedom of time, freedom of debt, freedom from suffering. I’ve been a featured expert on the Hamilton Life Show, published in Thrive Global and The Huffington Post, and I speak on stages all across the world. Minette Riordan: … Brad Dobson. We are the co-hosts of Structure and Flow: The Productivity Podcast for Creative Entrepreneurs, bringing you great tips. And today, an awesome guest on how to get more productive, get more done, without it really taking over your life. So, you know on this show if you’ve been listening for a while, we’re all about grace and ease. Not about the hustle. So we’re extra-excited to have Lisa Pezik, all the way from Toronto, Canada, as our guest today. Welcome, Lisa. Lisa Pezik: Thank you so much! I’m so excited to be here. Minette Riordan: We’re super-super happy to have you. And Lisa and I have a really fun conversation a couple of weeks ago, and started getting to know each other a little bit. And Lisa, are you coming to Santa Barbara next year? I’m trying to remember if that’s where I met you, was through Soul Success Summit. Lisa Pezik: I’ll be speaking at the summit in April, which I’m very excited about. Minette Riordan: So we’ll both be speaking at the summit in April. Minette Riordan: Yeah, so this is how the magic of growing your creative business works, people. As you’re listening, so Lisa and I are both speaking at the same event next April. We met in a Facebook group online, and here we are, taking it a step further, creating those connections and collaborations. Brad Dobson: Oh, that’s hard. Minette Riordan: … [inaudible] your business faster. Said the introvert. Brad Dobson: That’s right. How do we talk to people? Minette Riordan: How do we talk to people? That’s a tough one for creatives. Brad Dobson: Yeah, a lot of them. They just want to create. Minette Riordan: And they just want to create. Which is what Stephen King says in our Quote for the Day. You want to share the quote? “Amateurs sit and wait for inspiration. Rest of us get up and go to work.” Stephen King is a writer, is definitely someone who works at his craft. Minette Riordan: He is. And I picked this because it resonated with me around your story, Lisa. And some of the amazing things that you’ve accomplished in your life, not the least of which is letting go of 100 pounds, starting your second business, starting to work with your husband in the last year, like so many things happening. So rather than us sharing your bio, we’d love to hear in your words, who are you and what are you excited about right now? Lisa Pezik: What a great question. I am a business strategist and content expert. But first and foremost, I am a mom to a crazy five-year-old who keeps me on my toes. I’m a wife. And it took me a long time to realize that the beauty of being an entrepreneur is the freedom that it allows you to be with your family. It can’t get wrapped up and be the other way around. Sometimes when you’re talking about hustle earlier, it’s like you’re hustling and hustling and hustling, while the rest of your life is falling apart. And you have to recognize that, because you don’t want to build the dream, get to where you want to be, and realize that everything behind you crumbled. And that was the rat race that I got myself into, when I first opened my first business, which was actually in fitness and health. So I’m a registered nurse by degree, and always had that passion to help people. But the fitness industry is very transactional in terms of you’re trading hours for dollars, you have to take more clients, you have to work longer, and I was doing that on top of working a nine-to-five job as a nurse. And actually, I was working shift work before that. But it got into a nine-to-five job, so my days were crazy. It was wake up, train, work all day, get the kid to bed, train at night, and there was no time left for me. Which is where the 100 pounds came. I was, on paper, I looked so accomplished. My business was booming and people were like, “I don’t know how you do it! You’re amazing,” when on the inside I was feeling like such an impostor. I’m overweight, I’m out of shape, I never get to see my son. My husband’s getting angry at me, and those were all choices that I made. Right? So, fast forward to about a year and a half ago. What I did was, I learned from the best, how to take my business online. And it was like, wow. The universe just opened when I realized the power of systems, the power of automation, the power of online courses, the power of social media. I just realized there was a different way to do it, because growing up, I came from blue-collar parents, which were like, great advice, but it was like, “Keep your head down and work hard, work that job, be thankful for that job, don’t make waves.” And just the idea of entrepreneurship was out in left field. For me, the cost was being overweight, being stressed, hormones being out of whack. It took us a little bit to conceive our first child, and it was just because I was just so misaligned with who I am and what I wanted to be doing. So, here I am, a couple of years later now, working with my husband, working when my son is at school. I’m on contract, actually, with my jobs, so I didn’t completely leave my nine-to-five. I was able to restructure it to make it work in my life, ’cause I’m still passionate about the work that I do there. So, I really like to challenge people with that, “This is the way it’s always been done. This is the way it has to be.” I really want to challenge you that it doesn’t have to be that way. Think about what you want, how you want to show up, what your expertise and knowledge is. And then go out and do that. ‘Cause it’s possible. You go after it. And that’s kind of the story for me. I knew what I wanted, I went after it, for the sake of getting my health back, getting my family back, and getting my life back. Brad Dobson: Very neat. I like that you, one of the terms you use was “rat race.” And this came up, I just read a book called Happier, which is from a … Oh gosh, I think it was a Harvard course given about happiness. Fantastic book. But he said that, “Rat racers are people that are looking for, they’re giving things up now for happiness later.” And so rather than having … I mean, it’s okay. You always want to look for long-term happiness. But they’re having no short-term happiness, because of the rat race. Brad Dobson: And I think that kind of aligns with the story that you told. That’s very neat. Minette Riordan: Well, I’m listening to Lisa’s story, and I’m thinking about where we were a decade ago as well. Brad was working a full-time job that he didn’t love. And that we were trying to raise kids. I was trying to grow a business and was really struggling. This was 2008, 2009. It was so incredibly stressful. And everything you said was so true. It all looked so pretty from the outside, like, “Happy family! Two amazing kids! Great partnership! And winning awards, left and right! And my business!” And yet we weren’t making money, we weren’t spending enough quality time together, we had, and around that time I lost my stepmom to cancer, and my weight ballooned. And it was all so true, and it does make you feel like an impostor. And I think I particularly appreciated what you said about this was a choice that you made. It might have been conscious choice, it might have been an unconscious choice. And so many times I think that we aren’t aware that we’re choosing this, that we feel that something is being placed upon us or happens to us. And it’s when we come back to that moment of choice, that change is possible. And that’s not the case, it’s the daily intentional stuff that you do. That I almost think that book, The Compound Effect by Darren Hardy, that leads up to you can have that big boom. But there was some daily intentional work that was done to have that big boom. And it’s doing that daily intentional stuff that probably nobody will ever ask you about. Minette Riordan: Right. I’m like, “How many hours did they put in, how big was their team, the people that are going that big that fast, they’re not doing it alone. They have support. There’s so many things I think that happen to make it go faster that are all important to the productivity puzzle. You mentioned in your story, wife, mom, now couple-preneurs, entrepreneurs, still working a job that you love. How do all these different roles impact productivity from your perspective? Lisa Pezik: Yeah. I am such a ninja with my block time. People are like, “I don’t want to put stuff in the calendar, I don’t want to plan every minute of my day.” I’m like, “Oh no, I plan every minute of my day.” Is accounted for. And that, I think, was a huge thing for me to be able to get time back with my family, with my husband. With my son. When I’m with my son, I’m with my son. And I’m not answering emails, I’m not thinking about anything else, and when I’m on a date night, or I’m having coffee with my husband in the morning, even if it’s five minutes. I’m 110% there with my husband for those five minutes. When I choose, once a day, that’s it, to answer my emails; I answer my emails once a day; I’m fully in it with my emails, writing back to people. Whatever I’m doing, I’m blogging, I’m podcasting, I’m coaching as a nurse, I’m teaching, I’m doing, whatever I’m doing, whether it’s mom, wife, nurse educator — I teach as a nurse now — trainer, coach, whatever it is, that has my 110% attention. And also, blocking the right amount of time for that task, because when I first started, I was like, “Oh, I get block time. I know how to do that. I can do that.” And I’m like, “It’s gonna take me 20 minutes to do a podcast, 10 minutes to do a blog, and 15 minutes to write a social media post.” And I was trying to block all these things in one time. And you know that sometimes technology doesn’t work, emergencies do happen. One thing at one moment can get your time. I think that [inaudible] multitasking, … 100 things at once, I really don’t think that serves you because your brain is just scattered. And then, you may be producing, but I don’t think you’re producing to the best of your ability. Brad Dobson: Yeah, I just started with really small 10-minute blocks, then worked my way up to longer ones. The eventual goal was to get to that Cal Newport peak work level of at least 90 minutes, but I was struggling with focus. And so it was a good way to habituate myself to just working that way. Brad Dobson: But I love the wisdom you’re bringing in. It’s very zen, quite literally, that’s the practice, is to be present and not separated by your thoughts and other things that are going on; to be in the moment. And that’s a lot of what you’re talking about, is to be able to bring your whole self to a single task. Minette Riordan: Yeah. And it’s a gift to your kids, and it’s a gift to your husband. To be that focused on them as well. And I think the appreciation we get back from clients, from family, is unique when we do that. And one of my very first mentors, she used to say the same thing, that she lived by her calendar. If it wasn’t on the calendar, it didn’t happen. And so we’re huge fans of time blocking. But other than time blocking, what’s your next best productivity hack? Because I know you have a whole bunch of them. Minette Riordan: [crosstalk]. I’m super curious, I don’t know what a power pocket is. Lisa Pezik: Oh, a power pocket is like, for me, it’s like the busy mom’s code of what we do sometimes, to get things done. This might be an overshare, but sometimes when I get that five minutes in the bathroom to myself, I’m writing something, texting something, getting an idea, taking action on a thought, waiting for 15 minutes to pick my kiddo up from school. That’s one of the freedoms I love now, being an entrepreneur. I don’t have to miss dropping him off, I don’t have to miss picking him up; that time is sacred. But, I’m just standing there for 15 minutes. I’ll make the most of that. So, I got a lot of stuff done in my business, in literally 15-, 20-minute power pockets that add up to that hour. And I think it goes back to that focus. But again, sometimes it is clunky. Sometimes it is messy. Sometimes you only have 15 minutes. So instead of saying, “Forget it, I can’t even begin to wrap my head around this,” take those 15 minutes, work in that power pocket, steal that time back. Because we say we don’t have a lot of time. And you do. You’re just not analyzing that dead time or that wait time that you have standing around. And then again, aligning what’s the best thing you can do in that time. I always like to say that whenever you’re pushing for a goal, or you’re doing something big, there’s five big moves to what you need to do. Beginning with that, like Stephen Covey, beginning with that end in mind. Lisa Pezik: It’s like, “What … achieve? And then, what are the five strategic moves that are going to get me there?” And you may be able to do one of those moves in 15 minutes. It might not have to wait another day or another day or Monday or next week. It’s like, where is that dead time, where you’re just waiting around, you’re standing around. So that’s like a little power pocket that I have, where I’m standing here for 15 minutes. I can still do something productive. So, really thinking about not quantity in minutes, but the quality of those minutes that you’re putting in. So, power pockets, is another huge one. Minette Riordan: Yeah. That’s really brilliant. I love that idea. ‘Cause I know my tendency is when I have those few minutes in between calls or sitting in the parking lot waiting for our daughter, I tend to check into social media. So sometimes that could be a power pocket, if I’m using that time productively, to go create engagement, as opposed to just surf my Instagram feed, looking at all the pretty pictures. It’s such a fine distinction that connects beautifully back to that moment of choice. Minette Riordan: And choosing to be intentional with our time. We make all of our clients do a time audit, and so it’s so important that people just really understand where their time is going. Brad Dobson: So I have a question. We often use this podcast for free coaching. Minette Riordan: I love it. Brad Dobson: One of the questions you pose was, “What exercises do you take people through to design their day?” And I would love to hear that. Lisa Pezik: Yes. So my favorite word of all time is “no.” I don’t think people use that word. I say “no” first. ‘Cause sometimes people pleasers’ gut reaction is to be, “Yeah, I can do that.” And when you’re good, and people ask you to do more, and you want to serve people, you load your calendar up with all these things you said “yes” to. And you look back and you’re like, “Ohmigod, my whole day is,” all these things that don’t move the needle forward for you. So, the first thing I tell people, get really comfortable saying “no.” Say “no” first. And it might sound mean, but make people state the case why you have to be the person that does this. Only you. Right now. In this moment. People say, “Well no, that’s kind of what I wanted it for.” They’re like, “I could actually have it by next Friday.” And you’re like, “Cool.” And I’ll schedule it later. So, get really comfortable with saying “no,” and asking those questions around why does it have to be me, and why does it have to be right now. Second, every Sunday is my reflection day, where I journal, and I take that life space time where I’m not mom/wife/coaching/thinking about my business. I look at my week, and I see, is there anything that I can just flat-out cancel? Is there anything that just does not need to happen this week? People understand when you explain. Not that you have to explain, but when you explain why you’re doing what you’re doing, and why it’s so important to you, people get it. So it’s like that old thing communication, when people are asking you something. And when you’re in turn, giving something. It’s just making sure you’re always keeping those lines of communication open, and that understanding is there, that you’re really truly doing the things that move your needle forward, and move other people’s needle forward. Minette Riordan: I love that. It’s all about managing expectations, right? Lisa Pezik: Yeah. So, say “no,” look at your Sunday, have a good bird’s eye. ‘Cause when you’re in it, you’re just sometimes going from to task to task to task to thing to thing to thing, that you don’t have that bird’s-eye view to go … It’s easy to look at a day and be like, “Here’s all my to-dos.” But then when you look at a week sometimes, you’re like, “Whoa,” right? Minette Riordan: Yeah. That’s another Stephen Covey tip. I’ve been re-reading The Seven Habits lately, and such good reminders. But that’s something he says. And I think it’s so crucial to, and we say, you need your annual view, your quarterly view, your monthly view, your weekly view, before you get to the daily task list, to make sure that it’s all connected. I’ve got what’s called a production calendar, so I know exactly what I’m focusing on. I know when I’m blogging, when I’m podcasting, when I’m going live on social media, when I’m doing newsletters. And it’s one focus a day, and that’s it for me. And that’s how I know how to do all those things in one day, because I have it blocked out, and that has to happen first. So if I’m gonna podcast, podcast first. Then I can answer social media messages, answer email. You have to be a little bit selfish as an entrepreneur. Be like, “Me first, my needs first.” Because if you’re constantly giving away all those pieces of you, then you’re not going to build that business that’s aligned with how you want to show up and how you want to serve. Right, [inaudible]. Brad Dobson: That’s interesting. I think one of the struggles that we’ve had is how that editorial calendar, and even the developing promotions and that type of stuff, can eat your shorts in terms of moving the needle. Obviously, promotional calendar and the work that you do there is to actually sell things, which is great. But, by the time you add a podcast and blogging and email marketing and social media and engagement in social media, that’s a lot of bandwidth on its own. Brad Dobson: And then all of a sudden you’re not doing business development things. Brad Dobson: … there’s this balance that we haven’t figured out yet, in terms of what moves the needle best. Lisa Pezik: Do I blog, do I podcast, do I write, do I this? Pick one, and consistently rock it. Then, when you identify a learning need, you’re like, “Okay, nobody’s opening our email. We need better subject lines.” That is your quarterly focus. See, as creatives, that’s the curse of being creative. Minette Riordan: That’s the curse and the gift. Lisa Pezik: [inaudible], it’s like everything grabs your attention, and you want to jump to that next thing. And it comes from that place of you want to be the best, you want to serve people, you want to learn, you want to grow. You don’t want to get stagnant and stale; creatives love new and fresh and exciting. And we work hard. Minette Riordan: Yeah. I love that. Such a great perspective. Lisa Pezik: Yeah. I don’t like it. Minette Riordan: Can you talk about that? Lisa Pezik: … I’ve used it for such a long time. And I didn’t realize that cascade in my brain of what that was creating, by calling it a side hustle. Because it made me think that it wasn’t important. And anybody that’s working a side hustle, or has a project on the side, the reality is, when you’re not working that nine-to-five, or eight-to-four, or 12-hour shift, if you’re a shift worker, whatever it is. And then outside of those necessity things, like your family and that stuff that has to get done that needs your attention, you’re working that side hustle. Or that passion project. Your constant focus and attention is relentless on growing that thing, or you wouldn’t be doing it. I don’t think we should call it a side hustle, because it minimizes the work that you’re doing, and minimizes your attitude towards it. It minimizes the way, it’s almost like you’re afraid to say it. I think you’re afraid to say it when you call it a side hustle. You’re like, “Well, I’m a registered nurse, by degree, but I’ve got this side hustle where I coach people in business, and content and social media on it.” Your confidence and your tone changes when you call it a side hustle. Minette Riordan: I love that. I never thought about it from that perspective. So, I’ve been making art for a while. Recently selling my art and I always thought about it as first, a hobby, then another revenue stream. I never thought about it as a side hustle. That would feel really icky to call it that. And I’m like, “I think what you need is just some patience.” Because given the nature of all these things that you’re doing, and her husband is a writer. So all these things are happening. So just that noticing our attitudes towards things, our own natural sense of impatience. And “hustle” implies impatience, as opposed to, as you said, doing the planning, putting the groundwork in. 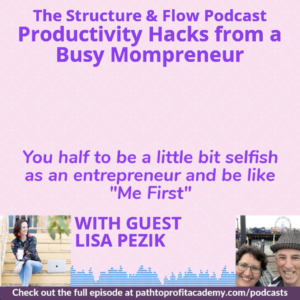 Lisa Pezik: It’s like, sometimes that can be a blessing and a curse too, sometimes, when you take something that you’re really passionate and good at, and make it a job, make it an income-producing activity. ‘Cause that sometimes, … it feels like work. And it doesn’t feel like the joy that you once got being creative and doing that. So I think it’s okay that to maybe step back and say, “I love teaching group fitness classes.” That was how I started. I loved being on stage. And what I take from that is, I love being on stage. I love speaking, I love being on podcasts. I love giving speeches. But I had to let go, that teaching those classes because that pulled me away from my family. So, as hard as that was to say “no” to that … And it was a revenue stream and the whole bit … that just wasn’t bringing me joy and I wasn’t showing up the way I wanted to. There was a different way I could tweak it and do it. You know, it’s almost cruel in school, when you have to pick a profession in college. Who knows what they want to be when they’re 18? Minette Riordan: That’s one of the things I love about Marie Forleo, really making a stand for being multi-passionate entrepreneurs, and being able to do all of those things. And you can’t necessarily do all of them at the same time. You’re building them and getting them in place sequentially. Minette Riordan: … over the last few years as well. Brad Dobson: Yeah, that’s a tough one. Priorities is, well, it relates to what I was discussing earlier. … If you’re not clear about them, it’s like core values. If you’re not being guided by those things, your days just become unfocused. Then you’re working on minutiae that don’t move the needle, like you talked about. Lisa Pezik: Yeah. And knowing what, I always say, you have to know what you’re willing to sacrifice and what you’re not willing to sacrifice. And for me, I’m not willing to sacrifice time away from my son, and time away from my family. So it’s like, I don’t get my stuff done by five or six o’clock at night, then I’m gonna be upset because it’s like, that’s time to get dinner on the table, talk about the day. He’s a little one, so it’s still bath routine, story. He wants 17 stories, which I do. That motivates me. Then I’m like, “I’ve gotta get my stuff done by this time.” Be really clear and intentional, ’cause if I don’t, then I gotta make that hard choice between, “Do I take time away from my family?” And then the mom guilt comes in. And that’s a whole ‘nother side topic about mom guilt that we could talk about. Lisa Pezik: A whole podcast on that. Brad Dobson: I’ll let y’all talk about that. Minette Riordan: Well, I think there’s dad guilt, too. Lisa Pezik: Parent guilt, 100%, I shouldn’t just say mom guilt. But you don’t want to put yourself in that position. Because that mom guilt, dad guilt, parent guilt, guilt serves no one. Lisa Pezik: So for me, 100%, you have to know what you’re not willing to sacrifice. And then you’ve gotta get really intentional about are you getting all those important things done, so that you can live that life [inaudible]. Minette Riordan: I love it, Lisa. So many great tips. Where can people go to connect with you, to find out more about what you’re up to, and get more of all this juicy goodness? Lisa Pezik: Yeah! So if you go to my Web site, www.lisapezik — L-I-S-A P-E-Z-I-K — the Canadians say zed — P-E-Zed-I-K — .com. It’s got my blogs, it’s got my podcast, it’s got some freebies on there, business related that you can pick up, talking about the cost of inaction. What happens when you’re not moving the needle. There’s a freebie PDF on there. There’s a freebie PDF that you can get about how to network more, how to connect, how to present an offer if you’re afraid about asking people how to work with you, how you get out there. There’s an exact script that you plug and play your information with, that you get more comfortable with who you are, how you serve, your stories. That sort of stuff. Brad Dobson: Yeah, I took a look. It looks beautiful. Minette Riordan: We’re about to have to redo ours as well. So we’re always looking for fun examples. Brad Dobson: I think maybe we’ll get a picture of you talking with your hands. I think that’s why you and Lisa connected. She’s a hand talker, too. Brad Dobson: [crosstalk]. I’m just messing with y’all. Minette Riordan: Anyway, Lisa, thanks for taking time out of your full schedule to block us in. We really appreciate it, and we encourage everybody to go to LisaPezik.com, L-I-S-A P-E-Zed, or Z-I-K.com. And check out all the goodness and the tips galore on social media. And better yet, come play with us in Santa Barbara in April of 2019, at the Soul Success Summit, which is going to be a really fun event. Brad Dobson: Cool stuff. Thank you so much, Lisa. Minette Riordan: All right, and we’ll see you guys all next week. Have an awesome, super-productive, and creative week. ← Episode 125: Are You Speaking Your Customer’s Language?